In NJ, NY and pretty much everywhere else, the subject of motorized awnings is a deceptively complicated one. But never fear: Patio Shades Retractable Awnings is here. As your hands-on purveyor of high-quality mechanical, hand-cranked or motorized awnings, arbors, pergolas and all manner of window, doorway and walkway protective coverings, PatioShades is your close associate for ensuring that the awning you get is both the awning you need and the awning you want. It’s all part of why our motto (Hand-Crafted, Above The Rest™) fits us so well – as well as your new motorized awning will fit your home or business. There’s a lot that goes into deciding upon the proper motorized awning for your NJ property. What size do you need? 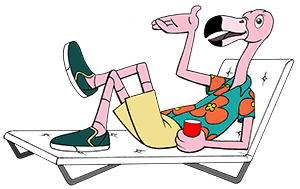 Our on-line mascot Frank the Flamingo can help with that, showing you how to conduct the right measurements and get accurate figures for Patio Shades to work with. What style, and which color? Our on-line Awnings Architect is there for you on that question, displaying the full range of options that would be right for your storefront, restaurant, shop, warehouse or commercial and industrial center. It’s true that there’s a lot that goes into making your decision about your new motorized awning feature, but it’s just as true that Patio Shades Retractable Awnings does a lot on your behalf to make sure you get exactly what you should get. The first step is as simple as the entire process is. Just call us at 908-259-4969 or toll-free at 1-844-NU-PATIO, or e-mail our team at [email protected] Shop anytime on-line at www.PatioShadesAwnings.com or www.PatioShadesRetractableAwnings.com for awnings, portable roofs, sunroom shades, pergolas, retractable and motorized or stationary screens that are totally customized, high-quality and, like our motto says, Hand-Crafted, Above The Rest™. Our motorized awnings are put together by hand in the USA, thanks to our facility in the state of New York. The materials are of the world’s finest quality, coming to us from our manufacturing partners in Italy. Each order is custom-made to your precise specifications for dimensions, appearance, style and color, then shipped straight to you for final installation – thereby completing your magnificent new motorized awning feature that will make your residence the envy of your New Jersey community, or your business the new hub of activity on the street. When installation time comes, Patio Shades Retractable Awnings yet again offers you a choice. You own the motorized awning outright, therefore you are free to install it yourself, rigging up the electronics and hanging it above the entranceway it will unfurl to protect. Alternatively, you may contact us at 908-259-4969, 1-844-NU-PATIO or [email protected] and request installation assistance; we will connect you with a local professional trained in precise installation techniques to assure you of the most proper and efficacious installation of your new motorized awning from Patio Shades Retractable Awnings. It need not be complicated. It can be, if you opt for an awnings firm not named PatioShades. But with us as your partner, you’ll soon be enjoying a unique, distinctive feature that gives your home modern comfort with rustic appeal, and gives your business a standout appearance that drives traffic and increases interest. In NJ, you really can’t go wrong with a new motorized awning from Patio Shades Retractable Awnings.